In Registrar of Hong Kong Institute of Certified Public Accountants v X, CACV 244/2016, 2 June 2017, the respondent accountants are appealing a decision of a Disciplinary Committee that they failed to apply a technical standard in the audit of a listed company; in particular, regarding the company’s treatment of the fair value of shares in its financial statements. At the time of writing, the appeal is due to be heard on 20–21 September 2017. As a result of the Disciplinary Committee’s decision the accountants were ordered to be reprimanded and to pay a penalty and the HKICPA’s costs. As is usual, the disciplinary proceedings were held in public. 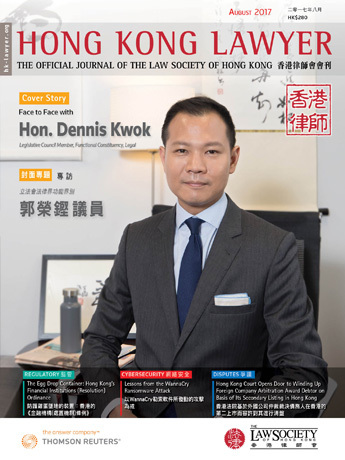 In accordance with the HKICPA’s prevailing policy, the Disciplinary Committee saw no reason to prohibit publication of its decision on the HKICPA’s website. Given the appeal and the irreversible effect once a reprimand is made public, the accountants applied for an order that publication of the Disciplinary Committee’s decision be restrained until final determination of the appeal (CACV 244/2016, 2 June 2017). Section 38(2) of the Professional Accountants Ordinance (Cap. 50) provides that (among other things) the Registrar shall not record the relevant sanctions (including, “record a reprimand”) before an appeal has been finally determined. It makes no mention of “publication”. Nevertheless, the Court of Appeal interpreted s. 38(2) of the Ordinance to mean that none of the sanctions were to take effect “in a substantive way pending appeal” (para. 41 of the judgment). Therefore, given that the reprimand is given full effect by making it public the legislative intent must have been that it should not be recorded in the Institute’s register or made public until the appeal is finally determined. Disciplinary proceedings concerning alleged technical breaches of the application of a professional standard (particularly, as regards audit opinions of the financial statements of listed companies) are nothing new (see, Industry Insights, June 2017). Despite the public nature of the disciplinary proceedings, the sanctions that may follow do not have to be made public. It is interesting to compare Registrar of HKICPA v Wong & Anor, CACV 233/2015, where the Disciplinary Committee directed that there be no publicity of its sanction unless the respondents agreed. The outcome of the appeal (to date) has meant a significant costs liability for the regulator (CACV 244/2016, 21 June 2017). It also illustrates the point that members of professional bodies usually take their professional reputations very seriously. It is one thing to make a finding of error with regard to the application of a highly technical standard and quite another to publish a reprimand against a professional person. In many instances of less serious infractions some regulatory bodies are tougher on their members than the public interest requires or than is deserved.